This easy to install high performance racing relay center features Five 40 amp and Five 20 amp relay circuits to make your race car wiring project much easier, and take up less room to boot! 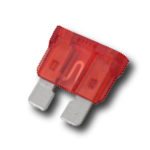 Each relay is individually controlled with either positive or negative activation (your choice) and each one is fused using standard Automotive ATO Blade Fuses, the same type of fuse used in most passenger cars available almost anywhere. It’s designed for use in today’s race cars that use 12-16 volt systems but it’s certainly reliable enough to use in your daily driver as well. One awesome feature is the visible LED’s on the inputs and outputs that indicate if the switch and relay are on, that gives you fast confirmation of circuit activation. Each replaceable relay can be either positive trigger, negative trigger or both can trigger allowing for control of many different circuits and maximum flexibility. This is a big plus when working with other electrical components such as controls for ignition, boost modules and progressive nitrous systems. Each relay also has a snubber circuit to prevent electrical surges on the coil which will protect your sensitive electronics from spikes. All input and output connections utilized studs with nylock style lock nuts for secure wire connections. The relay board is supported with vibration mounts to isolate it from the mounting platform, this also makes it easy to mount to a flat surface and remove from the front side if necessary.